Update: Council’s action on this report has been added at the end of the article. As I write this article on April 17, 2019, it has been three weeks since Toronto learned that Premier Doug Ford’s love for rewriting transit plans would turn Toronto’s future upside down. Ford’s special advisor Michael Lindsay wrote to Toronto’s City Manager Chris Murray first on March 22, and then in an attempt to paper over obvious problems with the provincial position, on March 25. Just over two weeks later, Ford announced his transit plan for Toronto, and this was followed by the 2019 provincial budget. A hallmark of the process has been a distinct lack of details about design issues, funding and the future responsibility for an “uploaded” subway system. In parallel with these events, city and TTC staff have met from time to time with Lindsay and his team to flesh out details and to explain to provincial planners the scope of TTC’s needs, the complex planning and considerable financial resources required just to keep the trains running. On April 9, Toronto’s Executive Committee directed Murray to report directly to Council on the effect of provincial announcements, but his report did not arrive on Councillors’ desks until early afternoon April 16 with the Council meeting already underway. The report reveals a gaping hole in the city’s knowledge of provincial plans with a “preliminary” list of 61 technical questions for the province. So much for the idea that discussions to date have yielded much information. Click on any image below to open this as a gallery. To these I would add a critical factor that always affects provincial projects: cost inflation. It is rare to see a provincial project with an “as spent” estimate of costs. Instead, an estimate is quoted for some base year (often omitted from announcements) with a possible, although not ironclad, “commitment” to pay actual costs as the work progresses. This puts Ontario politicians of all parties in the enviable position of promising something based on a low, current or even past-year dollar estimate, while insulating themselves from overruns which can be dismissed as “inflation”. The City of Toronto, by contrast, must quote projects including inflation because it is the actual spending that must be financed, not a hypothetical, years out of date estimate from the project approval stage. That problem is particularly knotty when governments will change, and “commitments” can evaporate at the whim of a new Premier. If the city is expected to help pay for these projects, will the demand on their funds be capped (as often happens when the federal or provincial governments fund municipal projects), or will the city face an open-ended demand for its share with no control over project spending? Unlike the city, the province has many ways to compel its “partner” to pay up by the simple expedient of clawing back contributions to other programs, or by making support of one project be a pre-requisite for funding many others. Presto was forced on Toronto by the threat to withdraw provincial funding for other transit programs if the city did not comply. Resistance was and is futile. How widely will answers to these questions be known? The province imposed a gag order on discussions with the city claiming that information about the subway plans and upload were “confidential”. Even if answers are provided at the staff level, there is no guarantee the public will ever know the details. At Council on April 16, the City Manager advised that there would be a technical briefing by the province on the “Ontario Line” (the rebranded Downtown Relief Line) within the next week. That may check some questions off of the list, or simply raise a whole new batch of issues depending on the quality of paper and crayons used so far in producing the provincial plan. It is simply not credible that there is a fully worked-out plan with design taken to the level normally expected of major projects, and if one does exist, how has it been produced in secret entirely without consultation? The province claims it wants to be “transparent”, but to date they are far away from that principle. Toronto has already spent close to $200 million on design work, primarily for the Line 2 East Extension (formerly known as the Scarborough Subway Extension, or SSE). The province claims that much of this work will be recycled into their revised design, and this was echoed by TTC management at a media briefing. However, with changes in both alignment, scope and technology looming, it is hard to believe that this work will all be directly applicable to the province’s schemes. The city/TTC may have asked “since last year”, but Queen’s Park chose not to answer. The city would like to be reimbursed for monies spent, but this is complicated by the fact that some of that design was funded by others. As an example of the mechanisms available to the province to ensure city co-operation, the Ford government will not proceed with the planned doubling of gas tax transfers to municipalities. This has an immediate effect of removing $585 million in allocated funding in the next decade from projects in the TTC’s capital program, and a further $515 million from potential projects in the 15 year Capital Investment Plan. At issue for Toronto, as flagged in the questions above, is the degree to which this lost revenue will be offset by the province taking responsibility for capital maintenance in the upload process. Over half of the planned and potential capital projects relate to existing subway infrastructure, but it is not clear whether the province understands the level of spending they must undertake to support their ownership of the subway lines. This is subject to an assessment of just what is supposed to happen both with proposed new rapid transit lines and the existing system in the provincial scheme. Mayor Tory has proposed an amendment to the report’s recommendations to clarify the trigger for the city’s agreeing to allocation of its PTIF funds to the provincial plan, so that “endorsing” the plan is changed to “consider endorsing”. Reports would come back from the City Manager to Council on the budget changes and uploading process for approval that could lead to the city releasing its PTIF funds to the province. The Finch East station on the Stouffville corridor is in a residential neighbourhood where there is considerable opposition to its establishment, and grade separation, let alone a station structure, will be quite intrusive. The Lawrence East station on the Stouffville corridor would be of dubious value if the L2EE includes a station at McCowan and Lawrence. Indeed, that station was removed from the city plans specifically to avoid drawing demand away from SmartTrack. There is no plan for a TTC level fare on GO Transit/SmartTrack, and the discount now offered is available only to riders who pay single fares (the equivalent of tokens) via Presto, not to riders who have monthly passes. Provincial plans for service at SmartTrack stations is unclear. Originally, and as still claimed in city reports, SmartTrack stations would see 6-10 trains/hour. However, in February 2018, Metrolinx announced a new service design for its GO expansion program using a mix of local and express trains. This would reduce the local stops, including most SmartTrack locations, to 3 or 4 trains/hour. I sought clarification of the conflict between the two plans from Metrolinx most recently on April 3, 2019 and they are still “working on my request” two weeks later. Some of the SmartTrack stations will be very costly because of the constrained space on corridors where they will be built. The impetus for Council to spend on stations would be substantially reduced if train service will be infrequent, and the cost to ride will be much higher than simply transferring to and from TTC routes. Both the Mayor and the province owe Council an explanation of just what they would be buying into, although that could be difficult as cancelling or scaling back the SmartTrack stations project would eliminate the last vestige of John Tory’s signature transit policy. The City Manager reports that the alignment of the provincial version of the three-stop subway is not yet confirmed, nor are the location of planned stations. Shifting the terminus north to Sheppard and McCowan and possibly shifting the station at Scarborough Town Centre will completely invalidate the existing design work for STC. This is an example of potential throwaway work costs the city faces. The design at Sheppard/McCowan will depend on whether the intent is to through-route service from Line 2 onto Line 4, or to provide an interchange station where both lines would terminate. The L2EE would have to operate as a terminal station for a time, in any event, because provincial plans call for the Line 4 extension to follow the L2EE’s completion. An amended Transit Project Assessment (TPAP) will be needed for the L2EE, and this cannot even begin without more details of the proposed design. Although this line is expected to follow the already approved route of the Relief Line between Pape and Osgoode Stations, the map in the provincial budget is vague about the stations showing different names and possibly a different alignment. This could be a case of bad map-making, or it could represent a real change from city/TTC plans to the provincial version. A TPAP will definitely be required for the extended portions of the line west of Osgoode and north of Pape. A pending technical briefing may answer some issues raised by the city/TTC including details of just where the line would go and what technology will be used, but the degree of secrecy to date on this proposal does not bode well for a fully worked-out plan. to seek replacement of funding that had been anticipated through increased gas tax transfers to the city. The city will consider dedication of its PTIF funding for the Line 2 extension and for the Relief Line to Ontario’s projects subject to this review. The city requests “confirmation that the provincial transit plans will not result in an unreasonable delay” to various transit projects including the Relief line, the one-stop L2EE, SmartTrack Stations, Eglinton and Waterfront LRT lines. public participation on the provincial plans. The City Manager is to investigate the acceleration of preliminary design and engineering on the Waterfront and Eglinton East LRT using city monies saved from costs assumed by the province. The City Manager is to report back to Council at its June 2019 meeting. 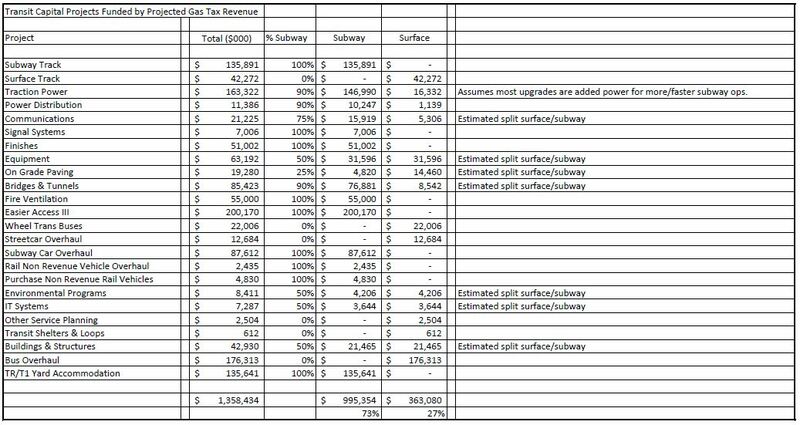 That City Council direct that, if there are any Provincial transit costs passed on to the City of Toronto as a result of the 17.3 billion dollar gap in the Province’s transit expansion plans, these costs should be itemized on any future property tax bills as “The Provincial Transit Plan Tax Levy”. This was passed by a margin of 18 to 8 with Mayor Tory in support. Toronto Council has approved the transit plan for Toronto featuring Mayor John Tory’s SmartTrack line and the Scarborough Subway after a long debate on July 14, 2016. Notwithstanding severe problems with financial pressures and the blind faith needed to expect that the entire package can actually be funded, Council added a few pet projects that never quite fade from view thanks to the efforts of individual members. LRT proposals for Eglinton East and West survived the vote largely because they are part of larger packages – SmartTrack in the west, and the Scarborough Subway Extension in the east. The subway debate has so polarized camps that “LRT” is synonymous with third class transit simply because it was the heart of the “non subway” option. Without the bitterness of the SSE that required subway advocates to paint LRT in the worst possible light, its potential role in Toronto’s future network might not have been so poisoned while other cities embrace this mode. Staff recommendations in the report were amended in some respects, and a few new clauses were added, notably one asking for City staff to pursue a co-fare arrangement with GO Transit. The Waterfront Transit Reset report is a separate agenda item and, at the time of writing, Council has not yet dealt with it. The Finch West and Eglinton Crosstown LRT projects are under Metrolinx, and they are already underway to varying degrees. At its meeting of March 31, 2016, Toronto Council passed several motions relating to the proposed rapid transit plan for the city.These evolved first as a set of staff recommendations, then amendments at the Executive Committee and finally amendments at Council. The changes along the way give a sense of how the attempt at a general approach taken in the new transit plan by staff can be warped into an emphasis on individual projects while losing sight of the overall purpose. This is not new in Toronto’s political theatre, but the city and region are at a crucial time when the “big picture” of the transportation network is essential. The challenge for those who would lead this process is to find a responsible balance between wider priorities and local concerns without making every decision only on political merits. Many of these motions involve requests for additional reports, and at one point there was some concern about whether city staff could actually handle the workload. One might ask whether the city should be making such important decisions if staff are unable to produce sufficient background material and simply want approval trusting their recommendations. While studying issues to death is a well-known delay tactic, rushing decisions without all the details is a classic method of railroading through decisions the city might regret later. There is certainly nothing wrong with asking for a more thorough study of items that have been omitted, provided that the same requests do not surface over and over again. If anything, Council has been woefully underinformed on transit options, priorities and tradeoffs, and such an environment “debate” often has little to do with the real world. Will every Councillor read every page of every study? No, but at least the material will be there to answer questions, support the good ideas and counter the dubious schemes. We hear a lot about “evidence based planning”, but this can be a double-edged sword where “evidence” might not support fondly-held proposals. This article groups Council’s motions by topic so that readers do not have to sort through the relationship of recommendations and amendments. 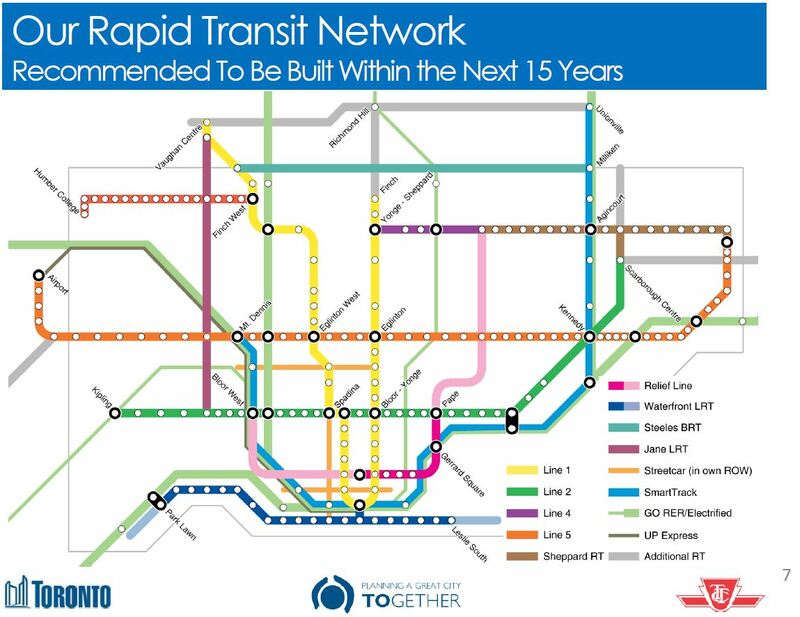 In Toronto’s never-ending fascination with new transit maps, the City Planning department has released a vision for our rapid transit network as it will be in 15 years. Despite much talk of “evidence-based” planning, this is a very political map, and I cannot help remembering then-Premier David Peterson’s announcement of 1990 (not long before he lost an election and Bob Rae wound up as his much-surprised replacement) that amounted to a chicken-in-every-pot map. There is nothing wrong with network-based planning, and indeed I have been beating a well-worn drum on that subject for years. But let us also remember that the Scarborough Subway exists because of the political clout of Brad Duguid, a former City Councillor, now Ontario’s Minister of Economic Development. Mayor John Tory, in Toronto Life, cites Duguid as saying that “if anyone tries to cancel the [Scarborough] subway, they’ll do it over his dead body”. “Evidence” apparently includes having a large cudgel to keep wandering pols in line. 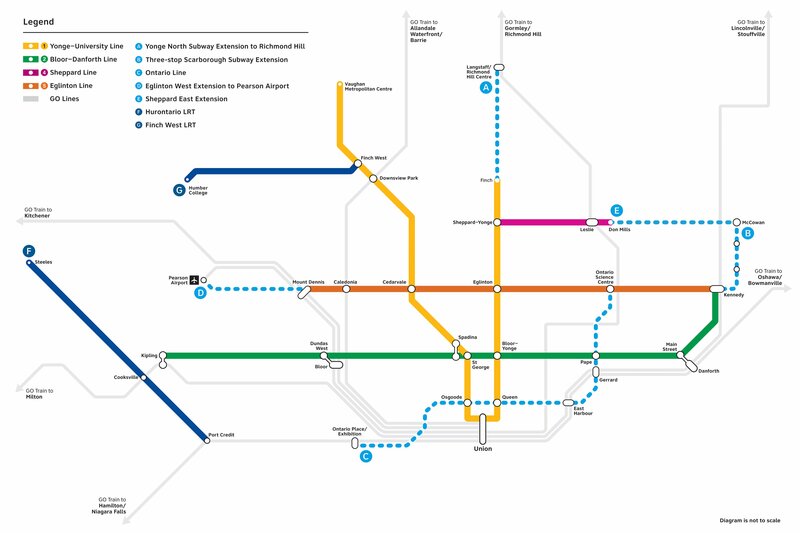 The map also includes the Mayor’s pet project, SmartTrack, and it’s no wonder that he steers clear of the Minister’s position given the need for a provincial agency, Metrolinx, to accommodate SmartTrack on their network. All of this is part of the “Motherlode” of public consultation sessions now running in various places around the City, and through Metrolinx in the wider GTHA. Background information and links to related material are available at Toronto’s TransitTO web site. The TTC Board met on March 26, and considered a meaty agenda that begins to address some important policy issues. Updated March 29, 2015 at 3:45 pm: The presentation on One Person Train Operation (OPTO) given at the meeting has been added along with comments. Updated March 24, 2015 at 8:10 am: After this was published, the TTC posted the CEO’s Report. The TTC board met on July 23 with some items of modest interest on the agenda. This is the second last meeting of the current board before the October municipal election sweeps away at least some of the current crew. Nothing of real substance will happen until the new Council takes office, and a new Mayor attempts to forge an agenda for transit that is more than a simplistic, pandering slogan. A request from newly minted Commissioner Pasternak for a report on his pet project, the Sheppard Subway extension west to Downsview. Update: An additional item came in via correspondence: a request for an express bus route from Liberty Village to downtown. In December 2013, the Neptis Foundation published a review of the Metrolinx Big Move plan authored by Michael Schabas. This review received prominent attention in the Toronto Star and is regularly cited in their coverage of transportation issues. Some elements also appear in recent comments by Transportation Minister Glen Murray, and it is reasonable to assume that his view of Metrolinx priorities has been influenced by the Neptis paper. Since its publication, I have resisted writing a detailed critique in part because of the sheer size of the document and my disappointment with many claims made in it, and a hope that it would quietly fade from view. Recent Ministerial musings suggest that this will not happen. What evidence suggests that the projects in the Big Move will double the number of transit riders and significantly reduce congestion in the region, as promised by Metrolinx? Does each project offer good value for money? Do all the projects add up to a substantial regional transit network or is the Big Move just an amalgam of projects put forward by diverse sponsors? The report itself addresses a somewhat different set of questions and notably omits the land use component. Will the Big Move projects achieve the Metrolinx objective of doubling transit ridership? Are these projects consistent with Metrolinx’s own “guiding principles”? Are they well-designed, consistent with international best practice, and integrated with other transport infrastructure? Will they support a shift of inter-regional travel onto transit? Are there alternative, more effective schemes that should be considered? Schabas’ work is frustrating because on some points he is cogent, right on the mark. Metrolinx has bumbled through its existence protected from significant criticism, swaddled in a cocoon of “good news” and the presumed excellence of its work. To be fair, the agency operates in a political environment where independent thought, especially in public, is rare, and years of planning can be overturned by governmental whim and the need to win votes. That said, Metrolinx is a frustrating, secretive organization conducting much of its business in private, and tightly scripting public events. Schabas rightly exposes inconsistencies in Metrolinx work, although his own analysis and alternatives are, in places, flawed and blinkered.